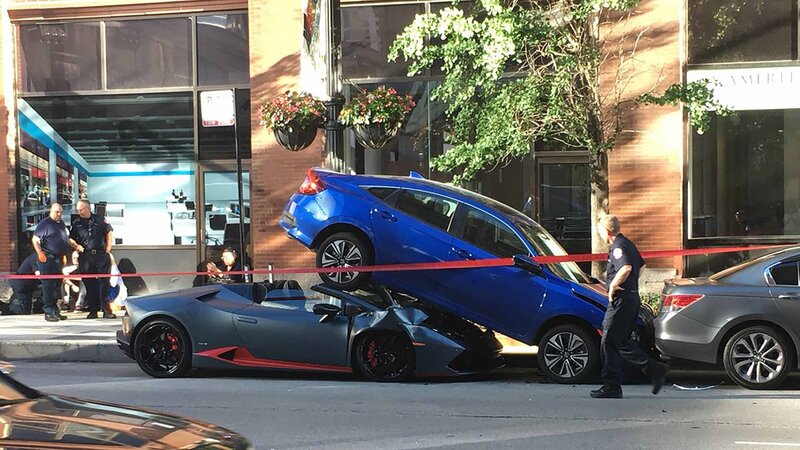 CHICAGO (WLS) -- A Lamborghini somehow ended up crushed underneath another car in Chicago's West Loop on Friday. Miraculously no one was injured in the crash, which happened near the intersection of Randolph and Clinton Streets. The driver of the Lamborghini, Dmitry Richie, admitted to ABC7 Eyewitness News that he was at fault. He said he was driving straight when another driver in the intersection began making a left turn, and he was trying to avoid an accident. "I pressed the acceleration instead of brake," Richie said. The Lamborghini driver said the car was totaled.